We manufacture a complete range of cleaning brushes, motors and mountings for conveyor systems and conveyor belts. They can be manufactured to suit different environments such as heat resistance, food grade i.e. for ovens, food production, bakery and seafood as well as being aggressive and durable if required i.e. for building materials, engineering, warehousing etc. Conveyor cleaning brushes are either close-wound brushes or an open faced spiral (auger style or Archimedes screw). The amount of aggression required to clean along with the type of conveyor system, determines the type and style of brush. There are several things to consider when thinking about a new brush conveyor cleaning system. Diameter and width: The free area the cleaning system is to be installed to ultimately determines the maximum and minimum sizes of the brush. Size of fill material: The type of conveyor and the amount of production remnant that is adhered to the track will determine the size of material be it wire, synthetic or a mixture of both which combines both scrubbing and sweeping at the same time. Brush density & pattern: Close wound brushes (giving a solid face) or open spirals offer different cleaning options dependent on the amount of aggression required to clean. Speed: Brushes generally operate in the opposing direction to the belt therefore careful consideration needs to be determined when using a non variable speed motor. Roller brush solutions can be more effective and they typically have a longer life. They are also very flexible, being suitable for a wide range of applications. 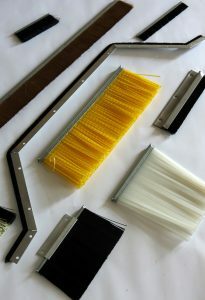 We are able to manufacture roller brush conveyor cleaning solutions up to 5 metres in length. The filling material is an important decision and will vary according to the conveyor cleaning conditions, for example wet, dry, hot or cold. A bespoke conveyor cleaning brush solution will cater to customer needs including wear characteristics, replacement cost and replacement down time. The conveyor belt is cleaned using brushes and a cleaning medium such as hot water. A roller brush is in constant contact with the belt and is cleaned by a lower brush which is semi-immersed in a cleaning fluid. Afterwards a squeegee roller dries the belt and an air knife can also be added to completely dry the belt. Galvanized steel and stainless steel can be used for the backing strip. The material used will be determined by the application of the cleaning solution. Backing strips can be manufactured to 5mm, 6mm, 8mm, and 11mm wide with filaments from 0.1mm to 3mm. 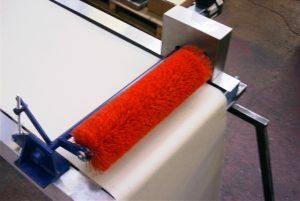 The roller brush can be trimmed to meet the specific dimensions of the conveyor belt. “Standard” brush units typically come with a fixed speed power supply, variable speed units can be supplied, which can account differing levels of wear on the brush diameter, surface speed and weather. To minimise cost, weight and space the cleaning brush can be driven directly from the conveyor, depending on the conveyor system and where it is sited. This approach will also ensure the brush unit maintains constant speed in relation to the belt. An alternative is to manufacture the drive motor as part of the brush roller which offers a compact solution. This is a low cost and easy to fit conveyor cleaning system. Individual applications and conditions can be met with a range of materials. Brushes can be manufactured up to 3 metres long with filament length from 15mm up to 500mm and diameters from 0.1mm up to 3mm (5mm diameter is also available on special orders). Brushes can also be offered with anti-static and flame retardant variants. Please also see Strip Brush for further information on the applications, materials and variations of brush strip.